Edwin John "Eddie" Fisher (August 10, 1928 – September 22, 2010) was an American singer and actor. He was one of the most popular artists during the first half of the 1950s, selling millions of records and hosting his own TV show. Fisher divorced his first wife, actress Debbie Reynolds, to marry Reynolds' best friend, actress Elizabeth Taylor, after Taylor's husband, film producer Mike Todd, was killed in a plane crash. The scandalous affair was widely reported, bringing unfavorable publicity to Fisher. He later married Connie Stevens. Fisher fathered Carrie Fisher and Todd Fisher with Reynolds, and Joely Fisher and Tricia Leigh Fisher with Stevens. Fisher was born in Philadelphia, Pennsylvania, the fourth of seven children born to Gitte (later Katherine or "Katie"; née Winokur; 1902–1991) and Joseph Tisch (1901–1972), who were Russian-Jewish immigrants. His father's surname was originally Tisch, but was changed to Fisher by the time of the 1940 census. To his family, Fisher was always called "Sonny Boy", a nickname derived from the song of the same name in Al Jolson's film The Singing Fool (1928). Fisher attended Thomas Junior High School, South Philadelphia High School, and Simon Gratz High School. It was known at an early age that he had talent as a vocalist, and he started singing in numerous amateur contests, which he usually won. He made his radio debut on WFIL, a local Philadelphia radio station. He also performed on Arthur Godfrey's Talent Scouts, a popular radio show that later moved to television. Because he became a local star, Fisher dropped out of high school in the middle of his senior year to pursue his career. By 1946, Fisher was crooning with the bands of Buddy Morrow and Charlie Ventura. He was heard in 1949 by Eddie Cantor at Grossinger's Catskill Resort Hotel in the Borscht Belt. Cantor's so-called discovery of Fisher was later described as a totally contrived, "manipulated' arrangement by Milton Blackstone, Grossinger's publicity director. After performing on Cantor's radio show he was an instant hit and gained nationwide exposure. He then signed a recording contract with RCA Victor. Fisher was drafted into the U.S. Army in 1951, sent to Fort Hood, Texas for basic training, and served a year in Korea. From 1952 to 1953, he was the official vocal soloist for The United States Army Band (Pershing's Own) and a tenor section member in the United States Army Band Chorus (an element of Pershing's Own) assigned at Fort Myer in the Washington, D.C. Military District. During his active duty period, he also made occasional guest television appearances, in uniform, introduced as "PFC Eddie Fisher". After his discharge, he began to sing in top nightclubs and had a variety television series, Coke Time with Eddie Fisher on NBC (1953–1957). Fisher also appeared on The Perry Como Show, Club Oasis, The Martha Raye Show, The Gisele MacKenzie Show, The Chesterfield Supper Club and The George Gobel Show, and starred in another series, The Eddie Fisher Show (NBC) (1957–1959, alternating with Gobel's series). Fisher's strong and melodious tenor made him a teen idol and one of the most popular singers of the early 1950s. He had 17 songs in the Top 10 on the music charts between 1950 and 1956 and 35 in the Top 40. In 1956, Fisher costarred with then-wife Debbie Reynolds in the musical comedy Bundle of Joy. He played a dramatic role in the 1960 drama Butterfield 8 with second wife Elizabeth Taylor. His best friend was showman and producer Mike Todd, who died in a plane crash in 1958. Fisher's affair, divorce from Reynolds, and subsequent marriage to Taylor, Todd's widow, caused a show business scandal. Due to the unfavorable publicity surrounding the affair and divorce, NBC canceled Fisher's television series in March 1959. Beginning in fall 1959, he established two scholarships at Brandeis University, one for classical and one for popular music, in the name of Eddie Cantor. In 1960, he was dropped by RCA Victor and briefly recorded on his own label, Ramrod Records. He later recorded for Dot Records. During this time, he had the first commercial recording of "Sunrise, Sunset" from Fiddler on the Roof. This technically counts as the biggest standard Fisher can claim credit for introducing, although it is rarely associated with him. He also recorded the albums Eddie Fisher Today and Young and Foolish (both 1965). The Dot contract was not successful in record sales terms, and he returned to RCA Victor and had a minor single hit in 1966 with the song "Games That Lovers Play" with Nelson Riddle, which became the title of his best selling album. When Fisher was at the height of his popularity, in the mid-1950s, singles, rather than albums, were the primary medium for issuing recordings. His last album for RCA Victor was an Al Jolson tribute, You Ain't Heard Nothin' Yet, released in 1968. In 1983 he attempted a comeback tour but this was not a success. Eddie Fisher's last released album was recorded around 1984 on the Bainbridge record label. Fisher tried to stop the album from being released, but it turned up as After All. The album was produced by William J. O'Malley and arranged by Angelo DiPippo. DiPippo, a world-renowned arranger, worked with Eddie countless hours to better his vocals but it became useless. His final recordings (never released) were made in 1995 with the London Philharmonic Orchestra. According to arranger-conductor Vincent Falcone in his 2005 autobiography, Frankly: Just Between Us, these tracks were "the best singing of his life." Fisher performed in top concert halls all over the United States and headlined in major Las Vegas showrooms. He headlined at the Palace Theater in New York City as well as London's Palladium. Fisher created interest as a pop culture icon. Betty Johnson's "I Want Eddie Fisher For Christmas", containing references to a number of hit songs, reached #28 in the Music Vendor national survey during an 11-week chart run in late 1954. Fisher has two stars on the Hollywood Walk of Fame, one for recording, at 6241 Hollywood Boulevard, and one for television, at 1724 Vine Street. In 1981, Fisher wrote an autobiography, Eddie: My Life, My Loves (ISBN 0-06-014907-8). He wrote another autobiography in 1999 titled Been There, Done That (ISBN 0-312-20972-X). The later book devotes little space to Fisher's singing career, but recycled the material of his first book and added many new sexual details that were too strong to publish before. Upon the book's publication, his daughter Carrie declared: "That's it. I'm having my DNA fumigated." When she was interviewed, Debbie Reynolds said that she could understand being dumped "for the world's most beautiful woman", referring to Taylor, who was previously a close friend. Taylor and Reynolds later resumed their friendship, and mocked Fisher in a TV movie written by Carrie Fisher, These Old Broads, in which their characters ridiculed the ex-husband they shared, named "Freddie". In his memoirs, Fisher admitted to addictions to drugs and gambling which aggravated his career problems. Fisher suffered from knee, back, hearing, and eyesight problems in his later years, the last of which were worsened by complications stemming from cataract removal surgery, and he rarely appeared in public. According to friends, he remained mentally vigorous and kept himself busy watching television and following news and politics, and singing his old songs while friend George Michalski played the piano. Michalski had worked on several occasions over the years to help Fisher get his name back on the music charts. He said "The '60s passed Eddie by; he missed that entire era of music. I'd play a Beatles song like "Something" for him and he'd think I wrote it." Fisher fell and broke his hip on September 9, 2010, and he died 13 days later on September 22, 2010 at his home in Berkeley, California, from complications from hip surgery. He was 82 years old. Fisher, Eddie (1984). Eddie: My Life, My Loves. Harper Collins. ISBN 978-0-06-014907-9. 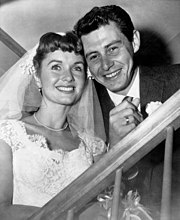 ^ "Eddie Fisher, former husband of Elizabeth Taylor, dies". The Daily Telegraph. September 24, 2010. Retrieved June 22, 2018. ^ Freedland, Michael (September 24, 2010). "Eddie Fisher obituary". The Guardian. Retrieved June 22, 2018. ^ Riley, John (September 25, 2010). "Eddie Fisher: Singer and actor whose career was overshadowed by his marriages and divorces". The Independent. Retrieved June 22, 2018. ^ Littlejohn, Georgina (March 24, 2017). "Who is Eddie Fisher? Father of Carrie Fisher and ex-husband of Debbie Reynolds - here's what we know". The Sun. Retrieved June 22, 2018. ^ "Lothario raked up hits, missus". The Sydney Morning Herald. September 28, 2010. Retrieved June 22, 2018. ^ Kaufman, Gil (September 24, 2010). "Eddie Fisher, Singer And Ex Of Elizabeth Taylor, Dies". MTV News. Retrieved June 22, 2018. ^ Fisher, Eddie; Fisher, David (September 1999). Been There, Done That. New York: St. Martin's Press. p. 3. ISBN 0-312-20972-X. ^ Been There, Done That, p. 2. ^ a b Been There, Done That, p. 11. ^ Been There, Done That, p. 14. ^ Kanfer, Stefan (1989). A summer world : the attempt to build a Jewish Eden in the Catskills from the days of the ghetto to the rise and decline of the Borscht Belt (1st ed.). New York: Farrar, Straus & Giroux. pp. 205–209. ISBN 978-0374271800. ^ Grimes, William (24 September 2010). "Eddie Fisher, Pop Singer, Dies at 82". New York Times. New York Times Company. ^ "Schottland to Head Social Welfare School at Brandeis University". Jewish Telegraphic Agency. December 1, 1958. Retrieved May 10, 2016. ^ Keck, William (12 Feb 2001). "Scandal's History for 'These Old Broads'". Los Angeles Times. Retrieved 1 October 2015. ^ Grimes, William (24 September 2010). "Eddie Fisher, Pop Singer, Dies at 82". New York Times. Retrieved 31 May 2018. ^ Whitburn, Joel (2002). Top Adult Contemporary: 1961-2001. Record Research. p. 93. ^ Roberts, David (2006). British Hit Singles & Albums (19th ed.). London: Guinness World Records Limited. p. 201. ISBN 1-904994-10-5.